I’ve written before that the 1830s are a period of fashion I find a little absurd looking. Yet, the more I draw clothing from those years, the more it grows on me. I am starting to almost like the era. Just almost. So, a quick overview of the fashions of this era shows an abundance of sleeves and bonnets. If the three decades from 1800 to 1830 were the era of the column silhouette, than the 1830s were the era of the oval. The sloping shoulders, wide-sleeves, round bonnets, and full skirts all give a oval shape to the silhouette. Plus, the wide skirts and sleeves also emphasized the desirable small waist, often accented with a belt. The invention of metal eyelets in 1828 allowed for a much tighter fit on a corset. There was no longer the danger of the lacing cutting through the hand-sewn eyelet due to tight lacing. So, waists got smaller. Like the earlier part of the century, people were still super into the Ancient Civilizations. So, references to the Roman and Greek civilizations abound. Hairstyles have names like Apollo’s Knot, one of the dumbest looking hairstyles ever. The hair in this fashion plate is an Apollo’s Knot style and so is this. It was very popular. And, clearly, not one of my favorites. 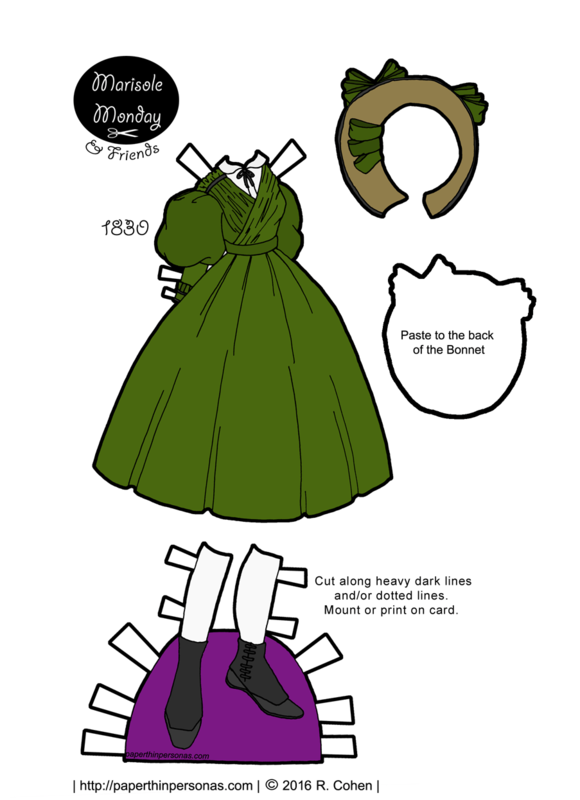 Anyway, this 1830 fashion plate from the Casey Fashion Plate Index inspired today’s outfit. As hard as it is to believe, I actually simplified the bonnet from the original drawing. Bonnets are not my forte, so I have mixed feelings about how this one turned out. All in all, however, I think I didn’t do a bad job on today’s foray into 1830s fashion. What do you think? More of this era in order? Not a favorite? And think about becoming a patron if you like the blog. Every little bit helps, plus there’s previews and sketchbook content. Your historical sets are always some of my favorites. I wonder sometimes with historical fashion if the everyday people found things like the Apollo’s Knot as ridiculous as you do. I mean, think about today’s runway fashions. What will future historians think of us?! Yeah, can’t you see parents in that era looking on their children with horror. “What on earth are you wearing? ?” But to me, Bad Fashion prizes go to late 18C aristocratic styles for men, with the high heels and the makeup and those patches. Ish. I like this a lot, reminds me of a Loretta Chase heroine. I think there’s always choices that make us go, “huh?” My personal one is various male facial hair throughout the ages. I’m a sucker for a nice beard, but I just don’t get mutton chops. I doubt I ever will.